Khan Noonien Singh is the most well-known genetically-engineered super-human, around. Not only did he lead a merry band (they’re super-humans…why wouldn’t they be super happy too?) of augments all across the world, eventually ruling over one quarter of the Earth’s population, but he also had the most amazing set of pectorals in the galaxy. What’s the one thing that a charismatic super-man, with a taste for all consuming power, could possibly need? …Great publicity! Every maniacal leader wishing to force coerce guide the masses into their grandiose plan needs to be seen as a caring, gentle, soul only looking out for the people’s wellbeing. The best and most historic way to get that point across is by using a propaganda poster to tout all of their benevolence. Well…that poster is finally here. Bye Bye Robot has launched its latest Star Trek poster, “Unify Humanity”, featuring Khan propaganda, by illustrator Steve Thomas. On acid free/archival heavyweight coverstock, its distressed, vintage feel harkens back to the propaganda posters of the communist era of early to mid last century. Get one for your very own at www.byebyerobot.com for $25. Austin, Texas – March 7, 2013 Bye Bye Robot is announcing a new poster featuring Captain Kirk’s iconic arch nemesis… Khan! As if straight out of the future-past, this poster, named “Unify Humanity,” sets an austere call for the masses to trust Khan’s “superiority” and leadership. Based on the early-to-mid last century’s communist propaganda posters of some of the world’s most persuasive leaders, this poster has a tongue-in-cheek take on these previous commanders and their push for obedience. 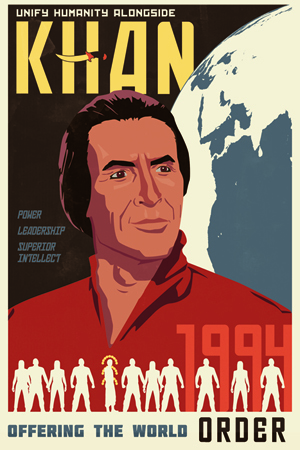 The “Khan Propaganda” poster, under license by CBS Consumer Products, is available for purchase today from www.byebyerobot.com for $25 plus shipping. Steve Thomas is a graphic artist and illustrator specializing in retro styled imagery. His affinity for vintage poster, propaganda and product art from the early 20th century along with his interest in retro-futuristic art from the mid-1900’s has led to the creation of his large portfolio of poster art.